Today's custom wallpaper post is inspired by satellite imagery. In our Space Wall Murals image gallery, you can find some cool wallpaper murals of different nebulas, constellations, planets, and comets. But when a satellite turns it's gaze back toward earth, you get some of the funkiest natural patterns and anomalies that create gorgeous murals. The image in our inspiration room is one of my favorite space murals. It is a satellite shot of the Ganges River Delta. 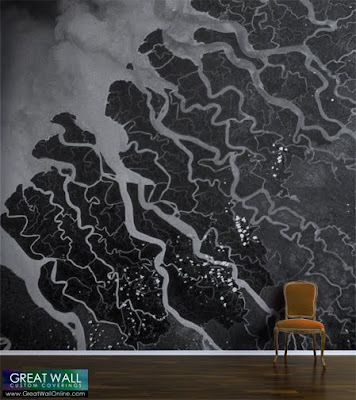 The river forms a massive delta as it flows into the Bay of Bengal. The resulting look from space is a tendril-like collection of crooked lines that jag there way across the mural. Contact us for more satellite custom wall mural options! Very beautiful mural. Very like. I have visited your site, and thinking of your suggestions. Tell me if I can offer my drawing here http://www.cannypic.com/ and you make a mural with him? How much is it?